Hervé Deschamps arrived at Maison Perrier-Jouët in 1983. A decade later, he became the seventh Cellar Master since the Maison was founded over 200 years ago. As a guardian of Perrier-Jouët’s style, he has maintained the floral and intricate character of the Maison’s cuvées: the non-vintage Classics range, as well as the Belle Epoque vintage collection. For over twenty years, he has shared his passion for champagne all over the world; his influence spreads from the Maison to French culture itself, a contribution which was officially recognised in 2016 when he was named a Chevalier de l’Ordre des Arts et des Lettres. Hervé Deschamps’ blending skills are highly acclaimed. 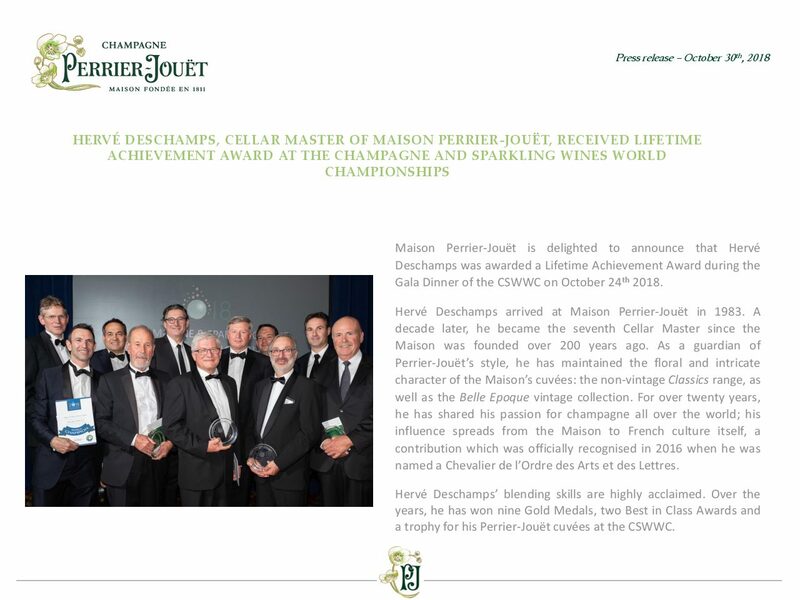 Over the years, he has won nine Gold Medals, two Best in Class Awards and a trophy for his Perrier-Jouët cuvées at the CSWWC.